This week our elected representatives will debate on whether or not to call a constitutional referendum to Repeal the 8th Amendment. They will vote on a Private Members Bill on this issue the week after. Over the next week, we’re asking you to tell your TD to support this bill. 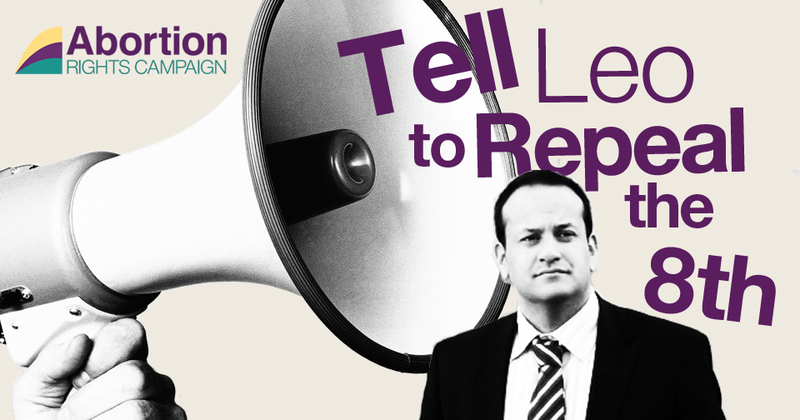 In February this year Varadkar said he would be “advocating” for reform in his party, warning that the eighth amendment of the constitution, which gives equal status to the mother and unborn, has a “chilling” effect on doctors. This could be the final opportunity the government has to better the lives of women in Ireland by safeguarding them against unnecessary risks to their health, and by sparing them the trauma and stigma that accompanies the restrictive laws which force women to travel overseas to access healthcare, or order illegal medication online to take here. Since election in 2011, Ireland has seen the death of Savita Halappanavar, the Ms Y case and most recently, the heartbreaking case of P.P., a clinically dead woman kept alive artificially against the wishes of her family so that her foetus could be kept alive. The people of Ireland want this law changed. In September 2014, a Sunday Independent/ Millward Brown poll found that of those who expressed an opinion, over 75% of people surveyed were in favour of holding a referendum to repeal the Eighth Amendment of the Constitution. As Minister for Health, you have an opportunity to to make a real impact on women’s lives. Please ensure the wellbeing, the health, and the dignity of every citizen by voting to repeal the Eighth Amendment. We are depending on you. Thank you all so much for participating in this campaign! We encourage you to share your experiences, messages, and resulting responses here or with us on Twitter or Facebook.